Many thanks for your expert help as usual. I'm glad you've posted these as I've seen them crop up quite regularly and wondered myself what they are. Somehow I've managed to resist buying one. Variously described as Whitefriars, Riihimaki or Scandi, I don't think they are any of those. I had thought Czech at one stage - a photo of the base will probably settle that one way or the other but I now think they are probably Italian (not Murano). Great fun aren't they. I would describe the color of the one on the left as golden amber. Tangerine is much more orange and usually refers to Whitefriars. BUT is the indent deeper on one end than the other Anne ? Many thanks for your superfast reply! :lol: I've taken a picture of the base. (Reminds me of a barley sugar sweet!). It has a rim and is slightly recessed - if that is the correct term. I would be really interested to know what they actually are. I bought them this morning for a couple of pounds each and thought they looked really retro (which I like very much). There is considerable wear on the base of both and they are surprisingly heavy. I must remember not to refer to one as tangerine! I don't want to upset the WF enthusiasts. Peter, so funny you replied, you said all things I was thinking of saying! I've seen this around and wondered where they come from too. I was leaning towards Czech also. Hard to see in the pic, but maybe the base suggests that might be true? Thanks Anne for putting these on the boards - it'll be fab if someone could say definitely where they come from, I'd like to know too! PS: I think you got them for a great price, they look really cool. Hello Peter. The indentation is the same. I think the angle at which I took the picture, added to the light, made it just look deeper at one end. The base is just like the top in fact, with a flat bit just where the rim ends. I guess these were made in a mould? It would be interesting to know how old these are too, whether they were cheapo variations on a theme based on for example Helena Tynell's textured vases of the 60s? I don't know anything about Czech glass. Like Max, I think these are really cool! Yes from the base I would tentatively say Czech altho I can't be sure until I see it in the flesh or confirmed by other evidence. Yes it would have been molded like much of Riihimaki production. The Czechs were and still are masters at molding ! As to design the Czechs have been in the forefront in modern design - see many other threads on this board !!!! You just got a bargain IMHO ...and Im green with envy !!! 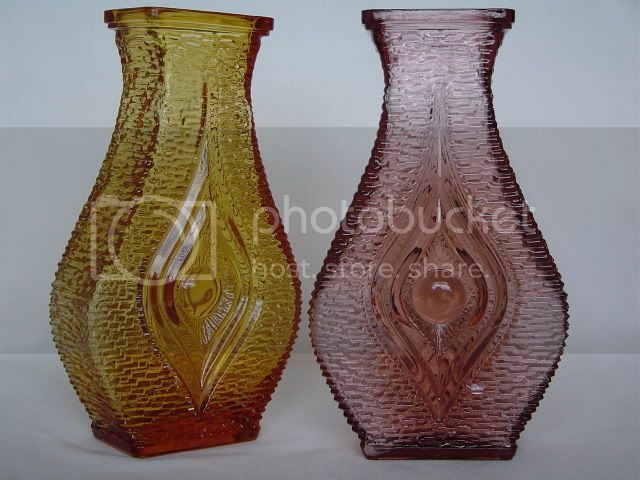 I absolutely LOVE my two vases, but when I compare them to the Riihimaki ones that I have, or my WF coffin vase, they seem to lack some of the subtlety and finesse that my others have - in my view. (I hope you are not going to tell me off now) :wink: In particular I refer to the top of the "eye" vases, which seem to finish abruptly and which, like the base (as they both look identical), look machine-made. I suppose it is this that makes me think that they are less valuable .... but what do I know about glass? - and I am more than happy to be corrected :lol: I'm learning a lot from this forum. OKOK Now you put it like that ..I understand and yes I thought I noticed some roughness on the base and hence my reticence. After you corrected my view of the photo I tended to discount it and now Im having doubts about Czech again. Before we start comparing designs etc we do really need to pin down a country if not a maker and I'm struggling now. Without a close-up of the rim it's hard to comment but looking again at the first pic the rim is an "odd" design which I don't think I've seen before and I think I can see why you should suspect "machine-made". However, any molding process would have involved machinery and I think it has more to do with the use of molds more suited to a fast paced mass production process and lack of time for care/ attention to each piece. Date-wise : Stylistically I would guess late 1960s - 70s. I do have a couple of vases which also look from this period where the quality is not as good as my known Czech pieces and I dont know where they originated. Are the colours also less bright ? I little on the dull side in comparison to your pieces by those other makers ? There are two or more possibilities. 1) That there were lower quality makers in Czechoslovakia whose production has not been identified as such as yet. I think this unlikely due to their centralized system. Quality controls would logically have been uniform. 2) More likely I think is that they were made by a mass manufacturer, possibly in Italy Bormio / Milan areas. Labour rates would have been much higher there than in the communist block requiring a faster production line. But all this is conjecture only at this stage. I could really use some help from Ivo and Marcus, (and others ?). Altho incredibly knowledgable as they are there's no gurantee they'll know either and we may have another continuing mystery here. I've taken the liberty of posting a close-up of the rims, to show them hopefully from different angles. Your suggested date ties in with what I was able to glean from the rather vague seller (who probably got them in a house clearance) and the wear on the rim on both bases seems to confirm that also. The colours are unlike any other in my '"Heinz" Collection' (57 varieties! ), and compared to the Riihimaki pieces, are subdued and muted. I must admit I wasn't attracted to them by their colour, but by their shape, texture and sculptural features. The close-up is a good representation of their true colour. Thats interesting, I've seen these many times, always attributed to riihimaki(sometimes Nanny Still), and I thought that's what they were, due to the sheer number of times they have been thus attributed on ebay, etc, even though they don't seem quite right for riihimaki. There is one on the whitefriars.com mistaken identities page referrred to as riihimaki. I have some really vague memory of reading a discussion about the design not referring to an eye, but to a flame. Sorry, not much help but I too will be interested to find out where it is from as I collect Riihimaen glass.